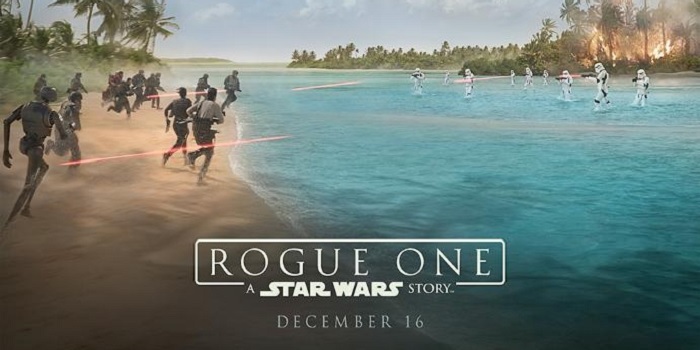 Rogue One begins without the iconic scrolling Serif Sans text of its predecessors, and without the fanfare of its triumphant, traditional opening theme. The name “Skywalker” isn’t even mentioned, a Jedi is not our main character and the epic beginning is much more like the understated indie openings of ‘Sundance’ than the expected galactic romp of epic proportion. This is a continuing trend: Star Wars history is constantly around and always in the peripheries, but Rogue One is given room to breathe under the pressure of its history. It is not a sequel to The Force Awakens, but dives back into its history to explore the story behind the stolen Death Star blueprints hidden by Princess Leia at the start of A New Hope. This all means very little to someone like me who hasn’t seen any of the older Star Wars films. This fact is greeted with shock, because the series is a landmark in film even for casual watchers, but it is intimidating to even begin a series with such a formidable legacy. Star Wars is threaded into our cultural consciousness, beyond circles of cinema fanatics into the casual references, and the iconic Darth Vader twist goes up there with the killer reveals of Fight Club and The Sixth Sense. The iconography in general is renowned, but this repute means that you won’t feel lost in its setting even if you don’t know the backstory. The reappearance of the rasping black suited super-antagonist was still spine-chilling even without knowing the minutiae of his history, and even as a stand-alone, this film is deeply rewarding. In a world where revolutions are now documented via individual feeds on Twitter, it is fitting that Rogue One tells a story about the foundation of anonymous sacrifice which gives ammunition to larger fight. These new Star Wars films don’t feel like blind followers joining the current hit franchise vogue to churn out sequels to anything semi-successful, but instead reward with new material packed with valuable meaning. In a world where revolutions are now documented via individual feeds on Twitter, it is fitting that Rogue One tells a story about the foundation of anonymous sacrifice which gives ammunition to larger fight. Not every story can, or should, be told for the greatest clarity, but the long-shot blockbuster approach sometimes downplays the scale of the fight and personal tragedies. New York’s destruction isn’t, and can’t, be fully felt in The Avengers when the pay off is found in the victory of the superheroes, but moments where blockbusters pause to tell small stories are always memorable, such as the elderly couple lying on the bed in Titanic as the room fills with water. It is a beautiful break for Star Wars to pause on this micro story which would otherwise be the background radiation of the bigger picture, before storming ahead into new ground. Performances are strong all around, but the stand out is Mads Mikkelsen in the role of Galen Erson who masters a tortured earnestness miles away from the bricked-up countenance of Hannibal. The use of CGI to resurrect Grand Moff Tarkin, a key antagonist, also poses interesting questions about the future of characters. First played by Peter Cushing, who died in 1994, the role is now voiced by Wayne Pygram. The waxy pallor and cartoonish feel of the CGI still isn’t seamlessly life-like, but it is real enough to feel believable and like the brink of a technological break out. Video games such as The Last of Us have already been double-take inducing and startling, but as we get closer and closer to resurrecting actors, ethics blur. Although the consent of his estate was taken, and it doesn’t seem as coldly commercial as the use of Audrey Hepburn’s image to sell Galaxy chocolate, it is a balance of telling the best story and preserving dignity which is a thin line future filmmakers will be forced to tread. Don’t be put off by articles claiming you need to know everything to see the film, as Rogue One is a gorgeous and self-contained story in its own right. It is a relief to see a film with a diverse case celebrated, but not scrutinised and marked as ‘other’. Headlines are becoming less pre-occupied about the horror of female lead and man of colour at the heart of a film, as was the case with The Force Awakens, and hopefully this success will encourage further open casting in Hollywood. In a year which has floored many, it is fitting that the most viewed film of 2016 is about politically turbulent times, but also the chance for hope built on the back of those who haven’t rolled over just yet. Pretentious, moi? Mainstream movies go art-house.